Paper in press, by the LCM team: "Cooperative mechanisms for networked music", to appear in Future Generation Computer Systems (journal by Elsevier). LCM, the Computer Music Lab (Laboratório de Computação Musical, in Portuguese) at the Institute of Informatics, together with the Electronic Music Center - CME (Centro de Música Eletrônica, in Portuguese) at the School of Arts, are the labs of the Computer Music Research Group from the Federal University of Rio Grande do Sul - UFRGS. Its creation, back in 1994, emerged from the need to explore both the technological aspects of music (now at the CME) and the development of computer music systems. Early research at the LCM began in 1994 at the Institute of Informatics, concerning Artificial Intelligence and Music. With one Macintosh LC II connected to a Roland A-30 MIDI controller and a Sound Canvas module, the MSc student (at that time) and musician Eloi Fritsch wrote his first programs in Max, EduMax and AcompMax, and in PROLOG, advised by Prof. Rosa Vicari. At that same time, Fabio Beckenkamp developed an artificial intelligence model for chord classification and harmony analysis, advised by Prof. Paulo Engel. 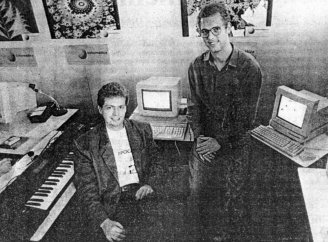 Eloi and Fabio continued their studies with AI and Music, and developed systems such as the SETMUS (Expert System on Musical Theory) in HyperCard (an early Apple multimedia environment), ARPA (Automatic Arpeggiator), and CAMM (Automatic Melody Composer). These systems were presented at some of the first Brazilian Symposia on Computer Music - SBCM, and also at the International Joint Conference on Artificial Intelligence - IJCAI, in 1995. Today, the LCM is coordinated by professors Marcelo Pimenta, Rosa Vicari, and Eduardo Miranda, with aid from Prof. Marcelo Johann and still from Prof. Eloi Fritsch (now teaching at the School of Arts). 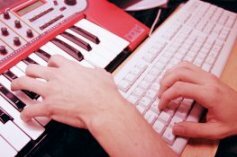 Besides AI and Music, and Systems for Musical Education, the LCM team now covers new fields of research, such as Mobile Computing, Ubiquitous Computing, HCI - Human Computer Interaction, and CSCW - Computer Supported Cooperative Work, in relation to computer music systems.